You might have heard of Roller Derby but still be asking yourself, ‘What is Roller Derby?’. It is a sport that originated in the USA in the 1930s and has evolved over the last eighty years. The modern version of the sport is fast, fun and mainly by girls and women. Joanne Brady has been finding out a bit about the sport and the women who play it. Roller derby is played on a circular flat track by two teams of five – four defensive players and one ‘jammer’, who is identifiable from the stars on her helmet. The aim of the game is for the defensive players to form a moving barrier and for the jammer to break through and do a lap. Every lap scores points and the team whose jammer has the most points at the end of each bout wins. The defensive ‘blockers’ have to skate in a way which allows their jammer to break through to score points without letting the opposing jammer through. It gets very rough and a referee is needed to make sure that the rules, such as not making contact with each other above the shoulder, are met. Players join a local league who they train with and within that league they take part in intra-league bouts. They also visit other leagues across the country and have inter-league bouts. One league, Hulls Angels Roller Derby, who were founded only a couple of years ago, has over fifty female members as well as a few male coaches and referees. We went to a training session to meet some of them and find out more. “the clothing and skates are very important and I enjoy maintaining my skates by oiling them, and I don’t mind getting greasy and dirty”. Natalie, or Knuckleduster Nat as she is known in the roller derby world, told us that the front row of seats are known as ‘the suicide seats’ and that at a recent men’s roller derby bout she was attending, she nearly got flattened by one of the skaters who came flying off the track. Despite its competitiveness and combat on the track, the roller derby community is extremely friendly. Knuckleduster Nat says it’s a good way of making friends with people with similar interests. She did competitive cheerleading at university and enjoys American sports, and though she spent a lot of the first three months falling over, she stuck with it and has recently taken part in her first bout – against Newcastle’s Whippin’ Hinnies. “it’s a friendly community and we have such fun that winning isn’t so important”. Roller derby is set to get even more popular in the UK. There are around fifty local leagues already. H.A.R.D recently took part in a bout against the Bruising Banditas of Halifax. It was a close run bout with the Banditas coming away the victors with a score of 179 – 166. Commiserations to Hulls Angels, though something tells me they won’t let it stop them carry on rollering. Photos of the team in action are courtesy of H.A.R.D. themselves, thank you! my mum wrote this after we came back from meeting them. That must have been fun to watch. Great article. 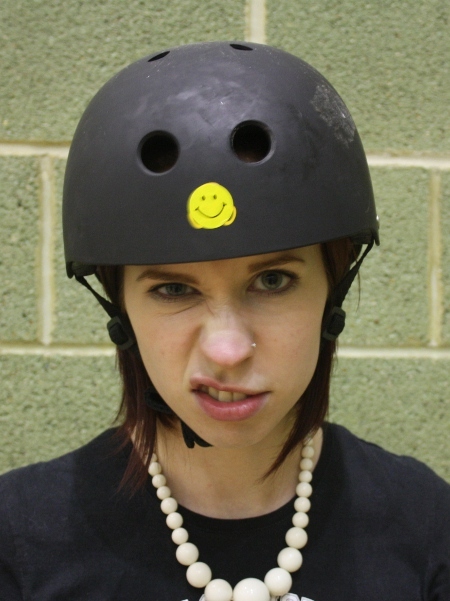 I’m a Mum who plays roller derby in the south west and it is brilliant fun!